Cortec VpCI Super Penetrant offers a deep penetrating formulation that loosens frozen parts locked in rust. Its deep penetrating capabilities allow the user to go through as much as 1/2 inch (13 mm) of rust in 30 minutes. VpCI Super Penetrant can be applied by a variety of convenient methods to meet any application needs including brush, hand pump spray, aerosol, spray application, or dipping. Available in 5 gallon pails (Cortec Product Code 16602895) or 55 gallon drums (Cortec Product Code 16602896). 5 gallon drum weighs 50 pounds and ships under our standard shipping rates. The 55 gallon drum must be shipped by truck. We will provide you with a freight quote before we ship this product. As the VpCI Super Penetrant breaks through deep rust, it displaces moisture and water. Its superior surface wetting and moisture displacing properties allow it to spread rapidly and get underneath the moisture layer normally present on metal under atmospheric conditions. While loosening the rust, it lubricates metal so frozen parts can move freely. Utilizing patented Cortec VpCI technology, the VpCI Super Penetrant forms an ultra thin film on metal that offers 6 months of protection from corrosion in extreme conditions. 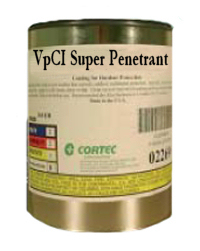 Cortec VpCI Super Penetrant can be used for indoor and outdoor applications. Its superior water displacing characteristics make it an ideal choice for applications of equipment and components that are exposed to outside weather. It also conforms to Federal Specifications fo VV-P-216 Penetrating Oil for Loosening Frozen Metallic Parts and ASTM D-971 Test for Interfacial Tension of Oil against water. Provides universal corrosion protection for ferrous metals, galvanized steel, aluminum, brass, copper, babbitt, zinc, cadmium and silver. Loosens frozen and rusted metal parts, making them easy to remove. Meets the regulations set by California Air Resources Board for Volatile Organic Compounds in consumer products. The product should be stored sealed. Agitate before each use. Shelf life is up to 24 months.